My movie career revived, in Italy. In the second installment of my Dewey & LeBoeuf saga, I told how my late friend Charlie McCrann wrote a feature length horror movie script as an NYU class project, then later produced, directed, and starred in that film, in which I played a minor role. The movie has been released in various places and formats under various titles: Forest of Fear, Charlie's working title, in Asia; Bloodeaters, by which it was known at movie houses and drive-ins coast-to-coast in 1980-81; Blood Butchers I'm not sure where; and Toxic Zombies, under which it was packaged as a VHS tape, later DVD, and played on the USA Cable network. Now I've learned that it's been revived in Italy under the title Il ritorno degli zombi. Here is a link to a YouTube video of the complete movie, dubbed in Italian. My part is from 34:55 to 39:30. My first line, in English, was "What the Sam Hill happened to you?" From what I can tell, there was no attempt to translate this word-for-word into Italian. Whoever dubbed me made me sound better than I do in English, though. Tom Rush and Circus Maximus bring the spring of 1968 to the fall of 2012. This is a mini iPod log. On my walk Saturday morning, I heard two songs that were both staples of the late night DJs on WBCN, Boston's first "underground" FM rock station, in the spring of 1968. I was then on the shank end of my first year of law school, and had just endured my first Massachusetts winter after many years of living in Florida. It was a hard winter, even by New England standards, and when, around the end of April, the last of the snow had melted and it seemed that every tree on the Cambridge Common had erupted in riotous bloom, I was ga-ga with spring fever. This coincided with, and facilitated, my falling hopelessly for a pretty classmate who was never to be my lover but nonetheless unwittingly shaped the course of my life. I'll lock the vagrant winter out, and bolt my wandering in. I'd like to bring back summertime, and have her stay for just another month or so. A little bit further along I heard another song from the BCN spring of '68 playlist that I find haunting, "Wind" by Circus Maximus, a band founded by guitarist, keyboardist, and vocalist Bob Bruno and Jerry Jeff Walker. If you quite naturally think of Jerry Jeff as part of the Willie 'n' Waylon Texas cosmic good ol' boy phenomenon of the seventies, it's surprising to know that he had been part of a band that produced a lush, Southern California romantic version of West Coast psychedelia. You can hear it in the video above, accompanied by a montage of art assembled by The Bacmaster. Duncan Island departs; Alice Oldendorff returns. 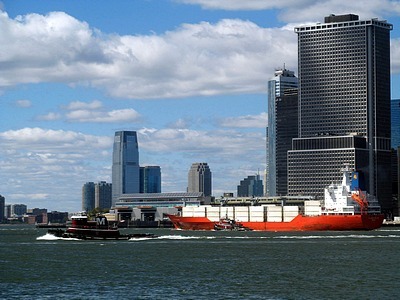 Two weekends ago, as I was walking between Piers 5 and 6 in Brooklyn Bridge Park, I saw the refrigerated container ship Duncan Island, of the Ecuadorian Line, departing from the nearby Red Hook container port (despite earlier predictions, it has survived). According to Shiptracking, a most helpful tool for ship buffs, she was bound for Antwerp. Yesterday morning I looked out my kitchen window and saw an old friend heading into the Governors Island Channel toward the East River and her customary dock at the Brooklyn Navy Yard. I quickly changed from PJs to exercise clothes and ran out to the Brooklyn Heights Promenade where I got this photo of Alice Oldendorff, accompanied by a McAllister tug. Alice is a particular favorite of Will Van Dorp, publisher of Tugster: a Waterblog, where he once posted another photo I took of Alice heading up the East River. For some reason Shiptracking gives no information about where she came from; I can only surmise that she's bringing her usual cargo of crushed stone from Canada, likely loaded at Halifax.